For visitor's information, go to Sambro Island Lightouse Heritage Society . Sambro Lighthouse is the oldest standing and operating lighthouse in the Americas. Legislation to establish the lighthouse was passed at the first session of the Legislative Assembly of Nova Scotia in 1758. Sambro Light tower is built of stone sheathed with wood shingles to protect the mortar from deterioration in the salt atmosphere. Originally the tower was white. It was given the three red stripes in 1908, so it would be more visible in snow. The interior granite tower, which rises to a height of 44 feet is the original build of 1758. There is no older working light in The Americas. In Canada, the only light established prior to Sambro Light was that at Louisbourg, which was destroyed when the fortress was taken. The lighthouse has stood guard off Halifax for 250 years. It has seen vessels of both the Royal and the Canadian Navy pass in peace and war; it has greeted immigrants, war brides, and refugees to a new land; it has watched the passing of the fishing boats, great and small, and the spreading sails of the yachting fleets. For sailors, it is the last sight or sound of Halifax, or the first on a safe return. Contributor: Kathy Brown. 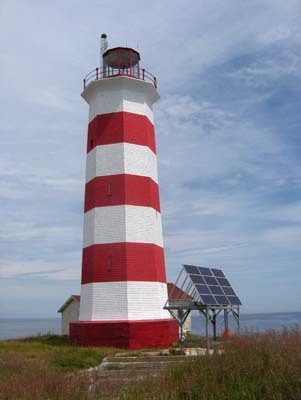 Sources: The Sea Road to Halifax, Hugh F. Pullen; The Lighthouse, Dudley Whitney; Lighthouses and Lightships, Lee Chadwick; Rip Irwin, in conversation, and in articles in The Lightkeeper, newsletter of the Nova Scotia Lighthouse Preservation Society. 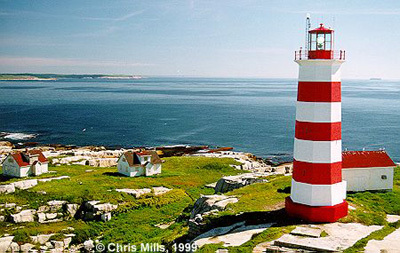 Earlier in 2008, we added information here that Sambro Lighthouse was endangered again. In March, at a meeting with the Coast Guard, we were assured that the lighthouse would be painted this summer. Now, we can gladly report that this has been done and add a wonderful image of a sparkling red and white Sambro Lighthouse. This new paint is supposed to be a high-tech coating that will last better than ordinary paint. We certainly hope so, the marine environment is harsh on any coating! The pictures show the condition of the lighthouse before it was painted. 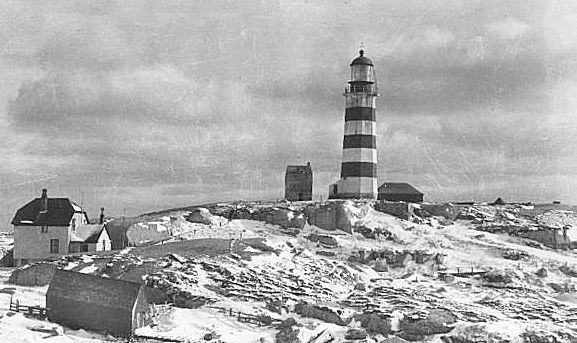 The Coast Guard promised to paint Sambro Lighthouse, likely in July. The collar at the base of the lighthouse would be examined but repairs will have to wait until later. Coast Guard is anxious that the lighthouse be in good shape for her 250th birthday in October 2008. The reinforcing collar at the bottom of the lighthouse, which prevents our very own "leaning light" from toppling over was disintegrating. The lighthouse had not been stained or painted since it was repaired in 1999.The stripes were pale pink instead of bright red! The paint which protected the flared concrete underneath the gallery was peeling off. Sambro Lighthouse is 250 years old in October 2008. Building the lighthouse was one of the first things debated by the Legislative Assembly of Nova Scotia, the first elected legislative assembly in Canada. It is fitting that the Government of Canada repaired this historic and important lighthouse in honour of her birthday. Sambro Lighthouse was successfully solarized with a powerful new lens and light in March 2008. To read about the solarization and look at photos of the process, or to download the same article in pdf format, click here. For the first nine years after the founding of Halifax, no signal marked these hazards. This lack of a lighthouse was not for want of trying. As early as 1752, the Governor and Council organized a lottery to cover the cost of building a light on "Cape Sambrough," but had no success. Finally, on the first day of the first session of the General Assembly of Nova Scotia, October 2, 1758, an act was passed to establish a lighthouse on "Sambro Outer Island." They appropriated 1,000 pounds from the duties paid on spirituous liquors, and instituted a tax on vessels entering the harbour. Commissioners were appointed and matters were put quickly in hand. The site was chosen, the money voted, and by early November the work was begun. It is probable that a temporary light was established on the island. "The Manager of the Light House is just come up. He lately went down to put it up; and has fixed it, with every thing that is convenient for Shipping: It was lighted the 23rd Instant; and as it is of Service to the Publick, to our Vessels as well as others, you will make it publick by publishing it in your Paper. It is situated one League S.W. of the Harbour, on Sambra Island. I thought it a new Thing, and of Service; so I have taken the Pains to give you Information of it." The building was of stone, 60 feet high from the base to the weather vane crowning the lantern. The white fixed light was, thus, 115 feet above sea level. Within a few years, word of inefficiency in the operation of the light reached the floor of the Legislative Assembly. The wreck of the sloop Granby, of Boston, in 1771, with the loss of all hands, blew the situation wide open. Apart from the loss of life, the Granby was carrying +3000 to pay the dockyard staff! Commodore Gambier, Commander in Chief of the Naval Station, reported that "the fatal accident happened for want of a light being properly kept in the lighthouse." He noted that H. M. Ships had, on occasion, to fire at the lighthouse in order to make the keepers show a light. Other vessels complained at being forced to pay for a light which "is a great annual expense to the Government and serves no other purpose than the shameful one of putting money in the pockets of a nominee of the Governor's." An inquiry found that, indeed, the keeper was appointed by the Governor. He was allowed the duties paid by ships entering the port and procured only the cheapest materials. Fish oil fuelled the light and if it went out and no ships were in sight, it was left out. It must be noted that at this time the lighting method for lighthouses was in its infancy, and the burning of fish oil was not unusual. Open oil lamps, without reflectors, produced a dim light. The glass in the lanterns smoked up constantly at all times of the year and the vapour from the flame caused misting and icing in cold weather. Keeping the lights lit and as bright as possible was a formidable job. 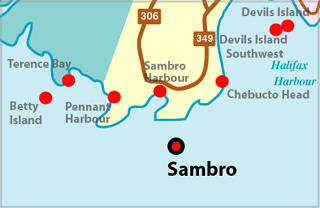 Commodore Gambier recommended that the government take over operation of the Sambro Light. The Naval Store Officer in Halifax was to be in charge. Nothing was done about this, for in 1772, Matthew Pennell was in charge of the light. At that time, fountain lamps with flues to carry off the smoke were installed. After that, there was far less trouble with the darkening of the glass which obscured the light. In 1834, the lantern had 128 small panes of glass that had to be kept clean. A Commission appointed in that year reported that nothing could be done to improve the light until a new iron lantern was installed. This was not done until 1864. In that year a new iron lantern with plate glass windows and a light with reflectors was installed. Mariners complained that the top of the tower was often obscured by fog. Serious consideration was given to lowering the height of the tower. In 1906, an extra 22 feet was added to the height of the tower. 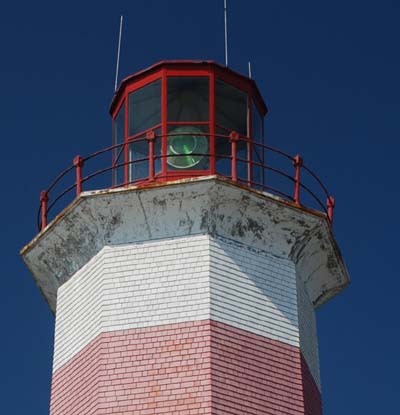 At the same time a first order Fresnel dioptric lens manufactured in France was installed, marking the light as one of Canada's major coastal beacons. By this time, 39 years after Confederation, the light was being staffed by the Coast Guard of the Government of the Dominion of Canada. In January of 1950, lightkeeper W. A. Smith noticed that the lighthouse was swaying! It was found to be leaning by 20 centimeters. In the spring, excavations at the base discovered that the mortar was cracked and some stones were loose. In the fall, grout was pressure-pumped in and a concrete collar about 90 cm. thick and 2 m. high was installed to reinforce the base. In 1966 the classic iron lantern which crowned the tower was replaced with aluminium and a 36 inch airport beacon replaced the huge lens. This DCB36 (36 inch diameter) airport beacon has a range of 24 miles and flashes every 5 seconds. The lens now greets visitors to the Maritime Museum of the Atlantic in Halifax, where its complex optics can be closely examined and admired. The tower height became its current height: 25 metres (82 ft), base to top. For many years Sambro was equipped with cannons to answer ship's signals in fog. Later, a steam fog horn was installed, then bomb rockets, after that acetylene guns, and finally, in 1963, a diaphone. In 2008 the diaphone was replaced by electonic horns. In 1937 Sambro Lighthouse was designated a National Historic Site and a plaque placed in the village of Sambro. 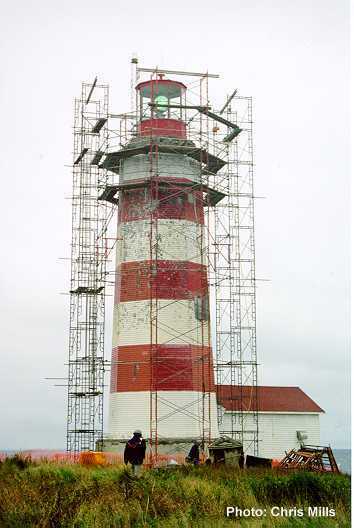 In 1996 the lighthouse received Federal Heritage Review Board Classified status, the highest ranking status for Canadian Government Heritage Buildings. 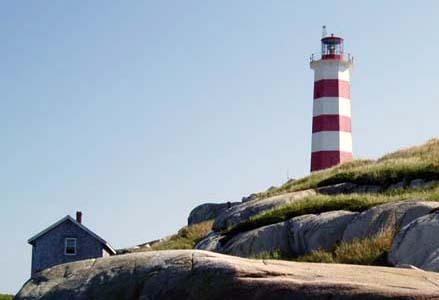 In part, the review stated: "The lighttower at Sambro Island was designated Classified for its historical associations, its environmental significance, and also for its architectural design. One of the most historically important lighthouses in Canada due to its age and its association with Halifax Harbour's marine traffic for over 235 years, this stone and concrete tower is considered the oldest operating lighthouse in North America. It has seen many developments in lighthouse design and apparatus technology, from its beginnings as a massive stone structure with a wood-framed sash-windowed lantern. The character of Sambro Island and its built heritage remains virtually unchanged. The lighthouse, by its very function and design, has been the dominant structure on the island since its completion ca.1760. The gas house and a number of small wooden structures, including a fog alarm building, are scattered across the rugged, exposed site and act as an appropriate foil to the lighthouse. The simple, utilitarian character of the site should be protected." Careful research in 2004 has established that Sambro Lighthouse is the oldest standing and operating lighthouse in the Americas. In 1997, through the efforts of the NSLPS, Sambro was designated a protected heritage building. It is number one on the list of Canadian lighthouses recommended for preservation by the Canadian Coast Guard to the International Association of Lighthouse Authorities. Amazingly, the building has been at risk because the concrete platform on which the lantern rests was disintegrating. Great chunks of concrete were falling off. The wooden sheathing which protects the mortar from salt air was rotting, as well. Thanks to action taken by the NSLPS, repairs have been made. Federal Fisheries and Oceans Minister David Anderson committed at least $125,000 to the project. Work began at the end of August 1998. The concrete platform was chipped away. It was discovered that the 1906 concrete mix used beach sand and stones (a common situation) and the resulting salt in the concrete had caused the deterioration. In addition, the installation of the 1968 aluminum lantern had not been well done. It had to be jacked up and the layer of concrete beneath it removed and replaced. This added extra days and expense to the project. The wooden shingles and strapping were also removed. When this was done, it could be seen that the tower was originally whitewashed. Now we have another research question: when were the shingles first installed? A team of historical experts visited the tower at the end of October and NSLPS should have their reports in February. The restoration work on the tower was completed in December, 1998, just in time for Sambro's 240th birthday! Sambro Island Lighthouse stands on a granite island about 2 nautical miles outside the entrance to Halifax Harbour, marking an area of dangerous shoals. Halifax was founded in 1749 as the major base for the British Navy in North America. The harbour, which is comprised of a wide entrance, a main harbour, a narrow channel and a large basin almost surrounded by land, is the second largest ice-free harbour in the world. Only Sydney, Australia is larger. It offered the British a safe haven for the largest fleet they could envision. The entrance was, however, often masked in fog and the more than thirty shoals surrounding Sambro Island were a grave hazard. The Sambro Island lighttower was constructed in 1758 or 1760. Alterations have occurred apace with developments in the technology for lanterns, and in 1906 the tower was raised 20 feet, changing its height from 62 to 82 feet. The lighthouse was designated a national historic site in 1937. The origins of the gas house on the site are obscure; it is known to have existed by 1939. Transport Canada is the custodian of the structures at the site. See FHBRO Building Report 95-34. The lighttower at Sambro Island was designated Classified for its historical associations, its environmental significance, and also for its architectural design. One of the most historically important lighthouses in Canada due to its age and its association with Halifax Harbour's marine traffic for over 235 years, this stone and concrete tower is considered the oldest operating lighthouse in North America. It has seen many developments in lighthouse design and apparatus technology, from its beginnings as a massive stone structure with a wood-framed sash-windowed lantern. The construction of this lighthouse at the approach to Halifax gives evidence of the city's growing maturity at this time, and is one of few remaining structures from this period. Inherently a landmark, the lighthouse dominates Sambro Island and has a considerable presence within the larger community. 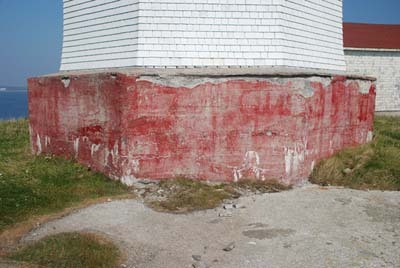 The nearby gas house was designated Recognized largely for its environmental significance as a character reinforcing component of the cultural landscape that is Sambro Island. The heritage value of the lighttower and gas house at Sambro Island reside in their simple yet elegant functional design, surviving early materials, and site relationships. The simple well-proportioned tower is octagonal and tapered, with a flaring lantern platform and a small, utilitarian aluminum lantern. The stone and concrete shaft with narrow slit openings is concealed under wooden shingles, which have been painted in alternating red and white bands. The profile and massing of the station should not be altered. The original portion of the tower is built of cut granite, five feet thick at the base and tapering to four feet where it joins the concrete extension added in 1906-07. A thick hardwood column supports a winding wooden staircase which climbs up through the tower's center. Structural interventions in the 1950s introduced additional concrete and reinforcing to stabilize the listing structure, and grouted the masonry at the base. Any further interventions should be based on an understanding of the original structural concept, and on the principles of reversibility and minimal intervention. The advice of a conservation professional with experience in stone and concrete preservation is recommended for any intervention. The light apparatus and related elements are integral to the function, and therefore the character, of the structure and should be maintained in place, with attention given to ensuring proper protection of metal surfaces. Paint types and colours should be based on precedent. The shingles should be renewed when they reach the end of their service life. The colour scheme - wide bands of red and white - dates from 1 908 and provides a distinctive identity for the structure which should be protected. The gas house, a shingled building of simple design and pleasing proportions, is nestled close to the water's edge on a prominent platform made of large dry-laid granite blocks. Its massing is of interest, with small gabled enclosures projecting from two facades. The utilitarian placement of windows and doors is in keeping with the functional character of the site and should not be altered. The wood-shingled roof is in keeping with the materials of the site. The sidewall shingles are extremely weathered and will require replacement in kind. Careful attention should be paid to ensuring that the openings are weatherproof and that roof intersections are properly flashed to keep water out of the structure. The brick chimney with simple corbelling at the upper courses merits masonry conservation expertise. The character of Sambro Island and its built heritage remains virtually unchanged. The lighthouse, by its very function and design, has been the dominant structure on the island since its completion ca.1760. The gas house and a number of small wooden structures, including a fog alarm building, are scattered across the rugged, exposed site and act as an appropriate foil to the lighthouse. The simple, utilitarian character of the site should be protected. Tower Height: 082ft feet high. 1968 - Iron lantern removed and replaced by aluminum. Tower 25 m. high. Solarized after a break in the electric cable, with a Tideland TRB400 lens system, in 2008.